With this feature, we can reduce the code to outlines. 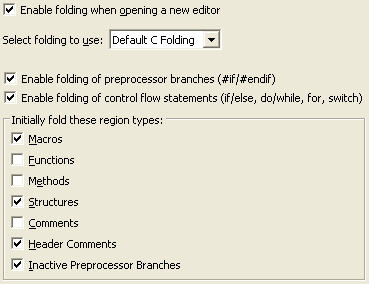 To enable folding in current source file, Right Click → Folding → Enable Folding. Eclipse can also fold code, as soon as the source file is opened. To enable it, open Window → Preferences → C/C++ → Editor → Folding. Be careful with this feature, for huge files it maybe resource intensive. Most of the options in the preferences are self-explanatory. See that there is a separate provision to hide license / copyright related header comment at the beginning of the source file by default. This feature will automatically hide just the license/copyright headers at the beginning of the source file, but show other relevant comments. The folding of preprocessor branches may not work as expected some times. This is how folded inactive preprocessor branch would look like. This how fully collapsed code would look.